Do you remember news of a strange steel sphere? 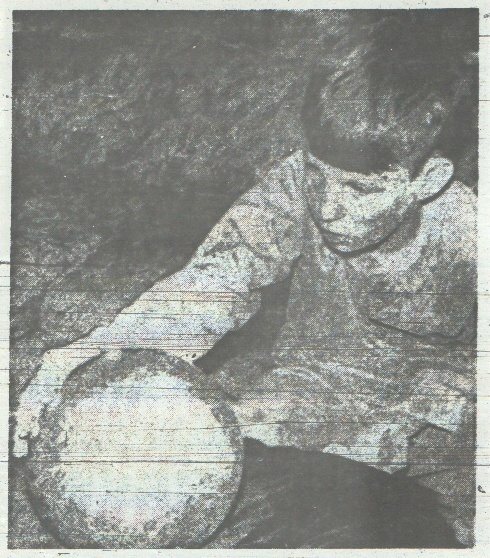 Does anyone remember news of an anomalous event that occurred in the early 1970's, namely a family finding a large steel sphere in their backyard? I remember encountering this news story many years ago, probably in Fate or Argosy magazine, and I suspect I may have read about it again in on of those Reader's Digest "Mystery" compilation volumes. The news story, as I remember it, was that one day a family found a large (perhaps 2 feet in diameter) steel sphere in their back yard. I think it occurred in one of the Southern states, perhaps Florida. It may have been made of stainless steel, and was thought much too big to be a ball bearing. I recall this story now, in light of a comment in today's Giant Sphere post about a spherical "pig" being used to clean out the inside of a pipe system; I recall this was suggested as a prosaic explanation for the nature of the large steel sphere. Took me a few.. Thought I lost my GoFu for a minute there. The gentleman that posts at the bottom of my link seems to be pretty sure what it is. I just came across your metal orb on the internet. I know what it is. First, take note of the fact that a second interior sphere exists within, and that it is space roughly 1/2 inch from the outer walls. That is clue #1. This is almost certainly not the one you're looking for, but I thought I'd include it for future searchers. Thanks for the leads, but my memory is that this particular sphere was quite smooth, and did not show evidence of having fallen from space, i.e. no burn marks or impact dents. It may have been a very odd prank, or a weird disposal. I guess I'm also interested in learning if anyone is familiar with industrial "pigs" allegedly used to clean pipes with. This event occurred in the early 1970's, or perhaps the late 1960's. JACKSONVILLE, Fla. (AP) - The United States Navy says it is mystified by a metal sphere found by a family here. "There's certainly something odd about it," CPO Chris Berninger said after initial attempts at identifying the 25-pound object that the Antoine Betz family says appeared outside their home here recently. "We're going to use a more powerful machine on it and also run spectograph tests to determine what metal it's made of," Berninger said. The family said the ball moves strangely, apparently of its own volition, and throbs as though a motor were running inside. The sphere, slightly smaller than a bowling ball, appears to be made of stainless steel. Yes! That's it, thank you. Much less than two feet across, I see, a testament to how memory is fallible. I remember that photo from years back, and indeed it was stainless steel and from Florida. I wonder what ever happened to 12 year old Wayne Betz...? I grew up in the sticks and would spend my childhood summers exploring the woods behind my grand parents' house. One day, miles deep into the woods I came across an abandoned toilet. It was laying in two pieces (tank and bowl) and had been there for a long while. It was completely inexplicable. Here in the forested middle of no where, miles from any home or where any home had ever existed, was a standard house toilet, dirty, vine covered, forgotten. To this day I can't imagine any reasonable explanation for the toilet's existence. I suppose it could have been some joke or odd ball occurrence which causes someone to heft a heavy toilet through the woods before finally depositing it randomly amid all the dead leaves.